Byyyy Neverending White Lights featuring Dallas Green.. Even though the song seems saddish, it actually makes me feel a whole lot better when I listen to it - enjoy! SO! I finally made it back to work this weekend! Yay! To celebrate, on Friday night, I did my nails.. And I was really excited about them because I knew they would make it through the weekend.. WRONG! I thought I was going to setting tables and such this weekend, but I was actually on dishes. Ugh. Wasted.. This was after day uno in the dishpit.. Sorry they look terrible, I should have photographed them the night before. I watched the tutorial posted by the very talented julieg713 - click her name to check it out! Anyways.. That is it for now.. I am going to go tidy up the house and bake some goodies. Finally get to have our 'Gossip Girl' night again! 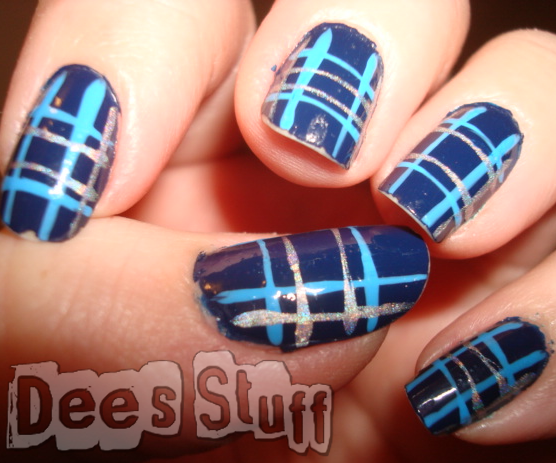 Love your plaid manicure. Very cute. Still looks pretty good after all that you had to do.